Chronic Obstructive Pulmonary Disease (COPD) is characterised by airflow limitation due to obstruction of airways. Due to peripheral airway obstruction, air volume may become trapped in the lungs (i.e. hyperinflation) . The respiratory rate may increase because of inspiration, which is initiated before emptying the lungs of air. Adjustment of rapid shallow breathing may lead to respiratory muscles fatigue. Hyperinflation may lower the dome of the diaphragm, shorten respiratory muscle fibers, and impair the possibility of muscle contraction. In addition, gas exchange may be inefficient. Hence, patients with COPD might develop symptoms of breathlessness or dyspnea [1–3]. Previous research has found that breathlessness is associated with symptoms of depression, anxiety, fatigue, sleeping difficulties, pain , and reduced quality of life (QOL) . The main goal of management and treatment in COPD is to improve symptoms and QOL . Although BCEs and RMT are often mentioned in the literature as common exercises and training for non-pharmacological treatments used for the management and improvement of breathlessness in COPD [6–10], the aims and the mechanisms of the two strategies are different. These differences have been discussed to a limited degree in previous literature; however, including articles that evaluate BCEs and RMT in the same review may clarify these differences. We included articles defined as SRs of the authors of the BCEs and RMT most commonly used and referred to in the literature [6–10]. These where; respiratory muscle training and BCEs of slow and deep breathing, diaphragmatic breathing, pursed lip breathing, relaxation techniques and body position exercises in humans evaluating the effects on breathlessness or dyspnea, other symptoms and quality of life in adult patients (>18 years) at all stages of COPD. We included SRs based on systematic literature search  in databases such as MEDLINE. We therefore included reviews that had performed a search in at least one database, along with SRs in all languages. The last written and updated SR of a previous SR and SRs that met at least one of the Measurement Tool to Assess Systematic Reviews (AMSTAR) criteria  were considered eligible. Figure 2 shows the SR inclusion process. The literature search identified 642 reviews. 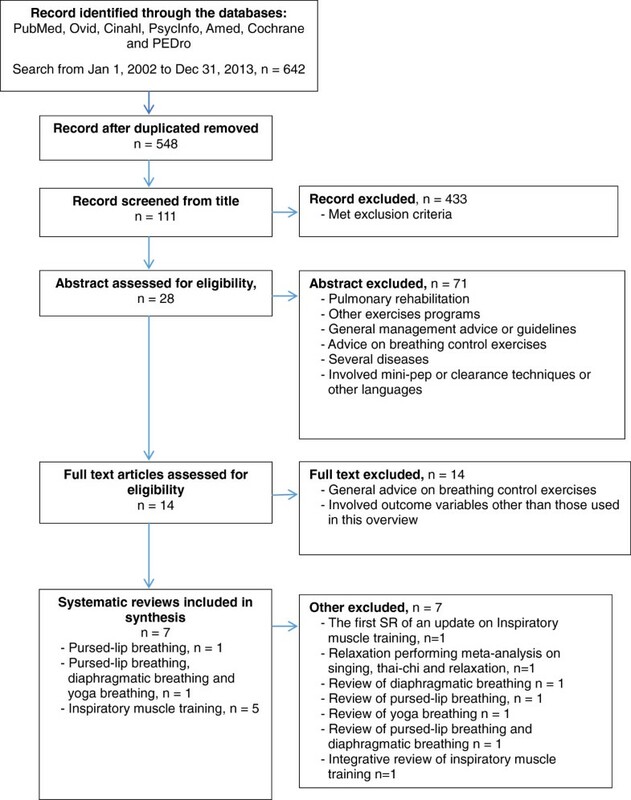 After checking titles and abstracts against the inclusion and exclusion criteria, we finally included seven relevant SRs on breathing control exercises. We found one SR evaluating relaxation exercises . This SR was based on complex intervention on depression and anxiety and the authors had pooled their data on three different exercises (i.e. relaxation singing, yoga, thai-chi). In a sub-group analysis no effect was found on symptoms of depression and anxiety. Neither singing or thai-chi exercises were included as exercises in the present overview and we therefore excluded this SR. Further, we excluded one SR that was a previous version of an update . We also excluded five reviews that had performed literature searches, but where the authors had defined their articles as integrative reviews or literature reviews [25–29]. These were therefore not considered to be SRs. Table 2 shows the included SRs. With respect to BCE; one on pursed-lip breathing  and one SR on diaphragmatic breathing, pursed-lip breathing and yoga breathing  were included. Regarding RMT five SRs on inspiratory muscle training [13, 31–34] were identified. There were no SR evaluations of the effects on breathlessness/dyspnea, other symptoms or QOL, on relaxation techniques, body position exercises or expiratory muscle training in independent SRs of people with COPD during the search period. For further information, see Table 2. Apart from two SRs [14, 31] (i.e. high quality) using no language restriction, the rest used only English-language articles in their reviews (i.e. Table 2) [13, 30, 32–34]. It has been found that journals using the English language tend to report interventions with positive results, whereas journals published in other languages also include studies with negative results . There was also limited information in the SRs with regard to including grey literature (i.e. abstracts from international congresses, unpublished work, book chapters, and theses). The exclusion of grey literature has been found to increase intervention effects in meta-analyses . However, we cannot be certain that results would have been different in the included SRs even if they had not included restrictions regarding languages or forms of literature, and therefore, a potential publication bias of under-reporting on lacking effects cannot be ruled out. In our overview, we found that, among the five SRs performing pooled statistics [13, 14, 31–33], only the high-quality SRs [14, 31, 33] performed a publication-biased analysis or mentioned the limitation of not performing publication- biased analyses. Publication-biased analysis involves a statistical test, such as Egger’s test, and/or a graphic aid, such as a funnel plot . Egger’s test is a statistical test for funnel plot asymmetry. A possible asymmetry in a funnel plot might be due to selection bias, such as language bias, or poor methodological quality of the studies included in the SRs [35, 38]. Therefore, not applying the publication-biased criteria in the SRs might result in presenting more positive effects from the studies included. Although this criterion was fulfilled, these tests were sparsely discussed in the SRs. The principle of inspiratory muscle training is to improve the strength of the diaphragm and the external intercostal muscles [3, 10]. Evidence shows that improvement of inspiratory muscle strength might be related to decreased effort in breathing and a positive change in the experience of breathlessness . For instance, inspiratory muscle training may lead to a decrease of the inspiratory time, which leads to longer exhalation time, in turn leading to relaxation of the muscles . The aim of this overview was to report subjective outcomes, but in relation to inspiratory muscle training. The improvement of inspiration muscle strength [31, 32, 34] and inspiratory muscle endurance [31, 34] shown in the different SRs (i.e. high and moderate quality) may explain the improvement in breathlessness. Higher training intensity and frequency were also reported or discussed as influencing a better outcome [32–34], but no clear concluding advice was given. 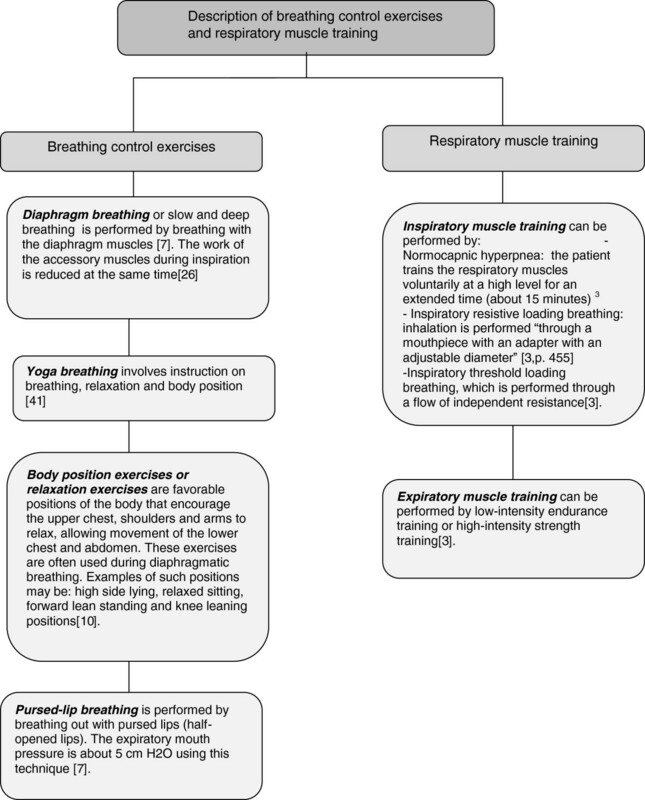 Due to hyperinflation and a shortening of the diaphragm, the effects of inspiratory muscle training may differ with regard to the stages of COPD and different impairment of the respiratory muscles. Most of the SRs included studies with a mean predicted lung function <55% (Table 2), but few specified any differences in the severity of COPD when reporting improvement of breathlessness. The SR by Gosselink et al. was the only one to evaluate the effects based on respiratory impairment at baseline (i.e. Pimax < 60 cm H2O), finding that these patients were more likely to have improved strength of the respiratory muscles. In the other SRs, there were no clear conclusions about which COPD patients might gain the most benefit from performing inspiratory muscle training [13, 32, 34]. Only one high-quality SR  combined inspiratory muscle training and expiratory muscle training in the meta-analysis. In fact, most of the studies included in the other SRs used only inspiratory muscle training. Furthermore, the studies in the pooled analysis used different inspiratory muscle-training techniques (see Figure 1 and Table 3). It is difficult, therefore, to provide detailed advice about which techniques are most beneficial in the practice of RMT. Hence, additional studies should focus on the effects of different methods of respiratory muscle-training techniques.